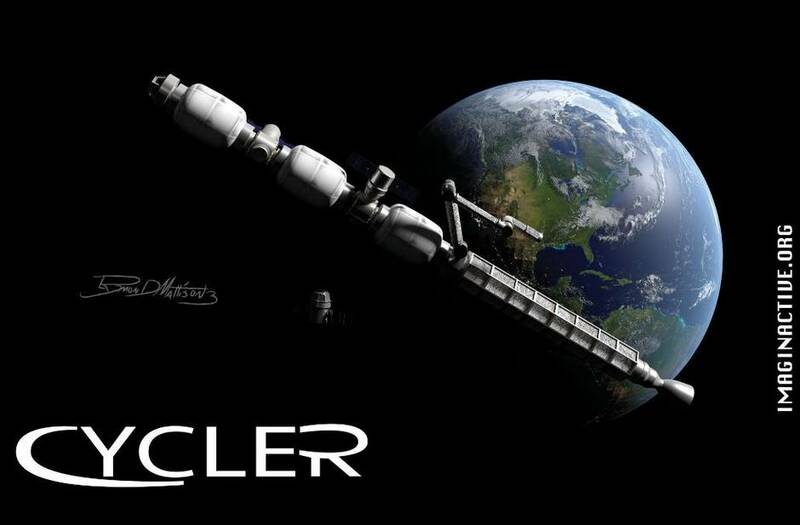 The Cycler’s largest part would be Bigelow Aerospace’s inflatable B330 modules, which would be linked together to form a series of three space wagons. These modules would be attached together by an interface modules (IM) that would each include lateral ‘Jefferies’ tubes connectors. 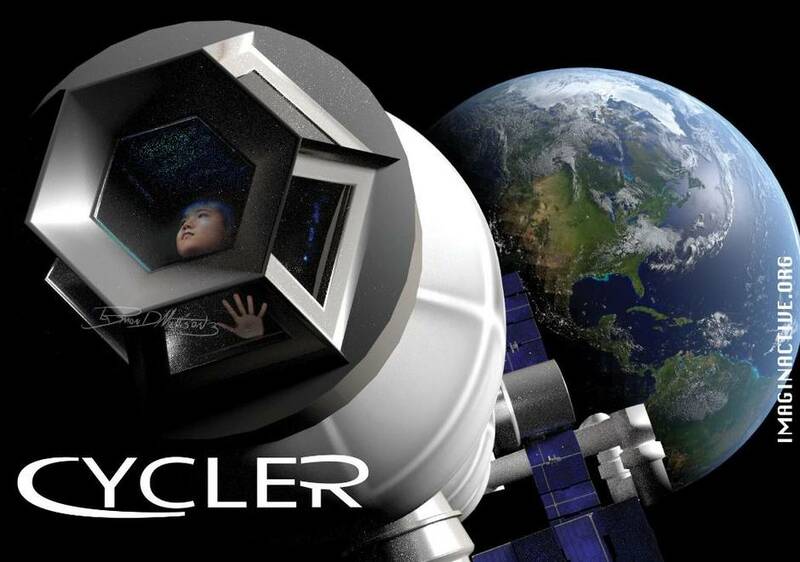 Each Cycler would be manned by four astronauts and would each be capable of transporting up to 12 passengers, most of whom would probably be space tourists going on the six-day trip around the moon. The interface modules would make it possible for astronauts to move easily between each B330 habitat, access other spacecrafts, or go out on space walks to service the Cycler. Each assembly would be equipped with two Dragon modules on its side, which would serve as both command centres, radiation safe havens, and emergency escape vehicles. The first B330 could be used as private sleeping quarters for the passengers. The middle module could be used for daily activities, as a viewing lounge, and a dinning area. The third one would serve as storage and the crew’s sleeping quarters. Behind the three B330s there would be a 100-foot-long open space cargo hold. This structure would be used to secure cargo brought to orbit by heavy lift rockets such as Space X’s Falcon Heavy or Blue Origin’s New Glenn. 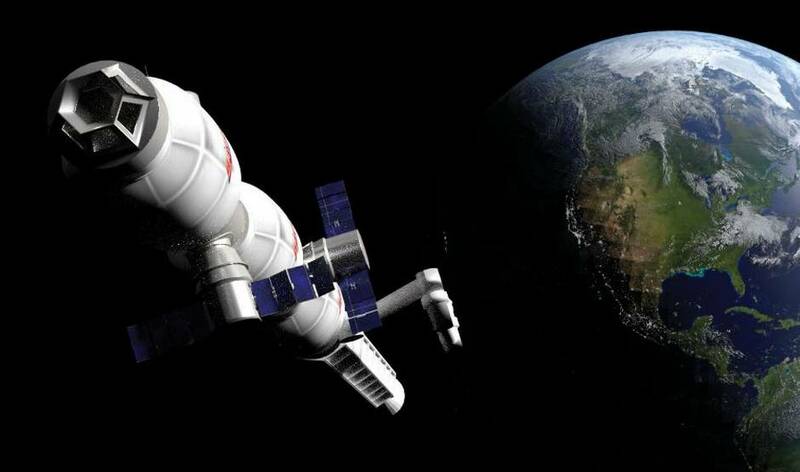 The Cycler would circle the earth in orbit and rendezvous with the cargo to bring it on board by means of a translational robotic arm like the Canadarm2. Then it would leave orbit to pursue its course toward the moon. When Space X’s Falcon Heavy rocket leaves Earth with its 22-Metric-ton payload, it’s going at an astounding 40,000 km/h. The second stage then burns more fuel and positions the vehicle in a geosynchronous transfer orbit (GTO), at which point its orbital speed would be reduced to 8,000 km/h or less. The payload transfer procedure would take place in GTO at an altitude of 35 km and would take 30 minutes. When the Cycler exits Earth’s orbit, it’s moving at the same constant speed of 8,000km/h, so it would need approximately two days to travel to the Moon’s orbit. To push the Cycler a master rocket would be attached on one end of the spacecraft. To control and change the direction of the Cycler, smaller rocket thrusters would be mounted on each side. The smaller thrusters could be mounted on motorized hinges to optimize fuel burn. One question that comes to mind is whether a second rocket should be mounted on the Cycler’s nose to help reduce its speed frequently. To land material on the moon, a lunar landing vehicle equipped with new ‘Xaxxon’(Hypothetical name) rockets could be designed and built by Masten Space Systems. This vehicle’s purpose would be to rendezvous with the Cycler, pick up cargo ejected during a lunar fly-by, and land it safely on the moon’s surface using existing rocket landers. 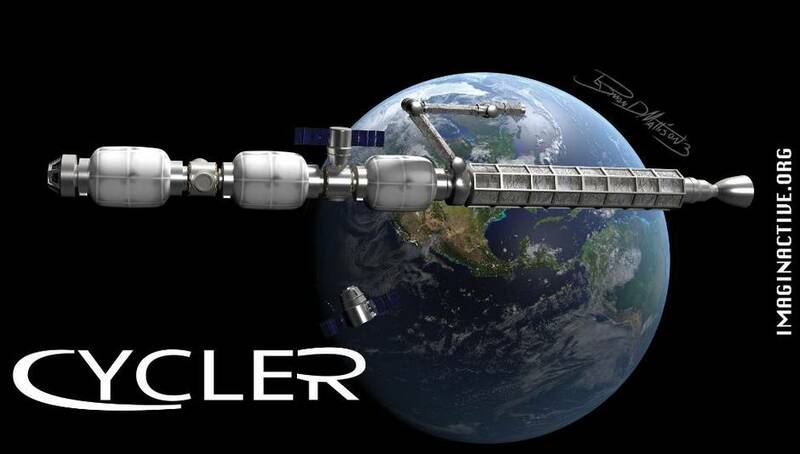 I believe that a spacecraft like the Cycler could serve as a modular prototype to test multiple technologies assembled together and demonstrate on a small scale that this vision can be accomplished. It would also become a way to ‘kickstart’ the space tourism industry and develop space travel. I would like to thank Dr. Rebecca Farr and Dr. Oliver Peraldi who both helped me structure the Cycler concept. I would also like to thank Ray Mattison from Design Eye-Q who created the renderings of the Cycler. Mattison is based near Duluth, Minn. He studied at the College for Creative Studies. Mattison also created the images of the Skreemr supersonic aircraft concept and the Rambler desert trike.